Life is nothing but the sum of choices we make. When you live to bring hope to the most despaired souls, dedicate a part of your life to bring harmony where there is a discord in the community and when you love the abandoned and the unfortunate ones of the society only then you have lived your life in a meaningful way. All these generous efforts will never go in vain. Forming a charitable trust is the great way philanthropists and rich donors decide to leave a long-lasting legacy to the causes they have supported all their lives. The trust is created so that the generous effort of the trust maker can continue to benefit the vulnerable, helpless and needy population for a long period of time even after they have gone. Charitable trusts are dedicated solely to carry out charitable activities in the society and are forbidden to join any commercial activities. These trusts are allowed to generate profits on their particular trading, products or services but all the profits must be invested in charitable projects for the beneficiaries and cannot be distributed among the trust members. There are charitable trusts supporting the healthcare system. These trusts assist the beneficiaries depending on the kind of medical needs they have. Medical trusts sponsor treatments of the helpless patients, arrange for specialist equipment and disability aids and help people get back on their feet again. Trusts working for women empowerment provide accessible education for women and allocate financial assistance so that they can become stable enough to support their own needs and improve the quality of life for their families. There are charitable trusts working to strengthen the identity and visibility of internal migrant workers and families. These trusts have the sacred mission to ensure a sustainable living environment for the migrant workers and their families through the provision of education, nutrition, health and life skill training and counseling. Charitable trusts are dealing into a wide range of social issues more than we could have mentioned here. Charitable trusts are saving lives, working for the advancement of education, relieving poverty, giving refuge to the unprotected or endangered animals, sponsoring healthcare services to the poor, giving shelter to the orphans or elderly and are engaged in many other types of social works recognized by the law. Charitable organizations are generally founded by rich donors or wealthy philanthropists but they need public funding to continue their generous services for public benefit. Charitable organizations cannot be run for profit yet they need a regular source of cash to keep the organization running and implement their charitable projects. It’s high time that we give back to our communities and the people. Without kindness, sharing and caring our world will turn into a barren land of merciless human forms and none of us would want our future generations to live in a cruel world like this. Donating to the most deserving and reliable charitable trusts will give strength and courage to the helpless people who see no hope for living. Let us build the habit of giving freely without expecting anything in return to make this world a better and tolerable place for every human being regardless of their race, social or financial standards. 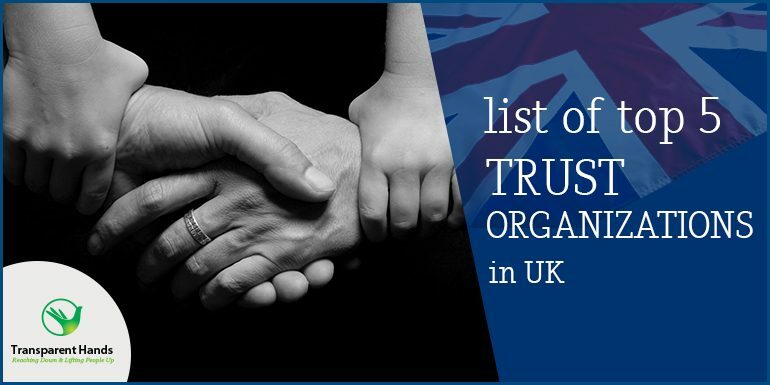 Transparent Hands is in first position in our List of Top 5 Trust Organizations in UK. Transparent Hands funds surgeries of poor patients using a global Crowdfunding platform. The platform provides visibility of poor patients and builds a personal and trusted bond between patients and donors while ensuring complete transparency. Crowdcube is in second position in our List of Top 5 Trust Organizations in UK. Having founded, and worked for several entrepreneurial businesses, they understand how difficult it can be to raise money to start and grow a small business. The task of securing investment is a notoriously perplexing and sometimes sluggish process that can be a struggle at the best of times. In today’s economic climate this has become even more challenging. They want to give entrepreneurs the opportunity to take control of raising funding from their own network of friends, family, customers and strangers. They also want to give people the opportunity to become an armchair Dragon and build their own investment portfolio supporting exciting new British businesses. Crowdcube is authorised and regulated by the Financial Conduct Authority (No. 650205). Crowdcube is backed by Balderton Capital. Since 2000, Balderton has invested in over 100 companies, principally across Europe. Notable realised investments include NaturalMotion (the mobile gaming developer, sold to Zynga in 2014), Betfair (the online betting exchange, 2010 IPO), LOVEFiLM (the home entertainment subscription service, sold to Amazon in 2011), MySQL (the open-source database software, sold to Sun Microsystems in 2008) and YOOX Group (the online retailer of leading fashion brands, IPO in 2009). The current portfolio includes innovative companies such as 3D Hubs, Globoforce, Kobalt, Nutmeg, Openet, Scytl, Talend, The Hut Group, Tictail, Wooga and WorldStores. Crowdcube has also raised a further £6m of investment to further accelerate its growth and help more businesses raise the finance they need to grow, create jobs and deliver returns to investors. The investment is led by Numis, a leading UK stockbroker and corporate advisor. Iconic Silicon Valley investor Tim Draper and venture capital firm Draper Esprit have also joined this funding round alongside existing backers Balderton Capital, one of Europe’s largest venture firms. Seedrs is in third position in our List of Top 5 Trust Organizations in UK. They let all types of investors invest in businesses they believe in and share in their success. They let all types of growth-focused businesses raise capital and business community in the process. JustGiving is the world’s most trusted platform for online giving. 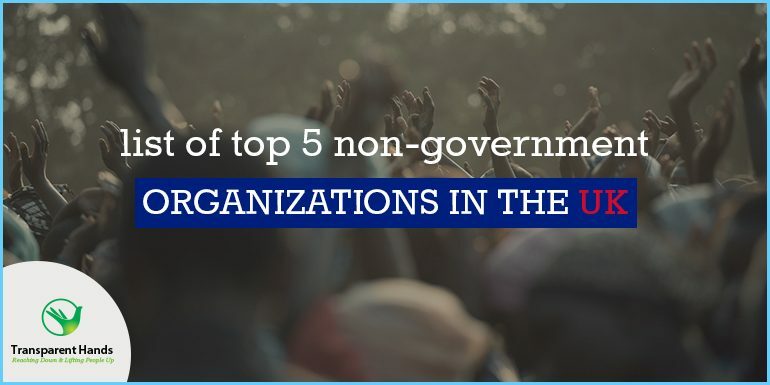 JustGiving is in fourth position in our List of Top 5 Trust Organizations in UK. Their mission is to ensure no great cause goes unfunded. They are enormously proud to have helped people in 164 countries raise over $4.5 billion for good causes since they were founded in 2001. They are a tech-for-good company. They charge a fee, all of which is re-invested into building innovative new tools to make giving better for everyone. They think of ourselves as the R&D team for every cause in the world. They are building on their 15 years of social giving history to create more intelligent and powerful ways of connecting causes with people who care, which are open to everyone and every cause, however small. They believe it’s not just what you do but how you do it. Their users trust us because they do not share their data with anyone without their permission. Uniquely, they never sell or trade personal information with third parties, or try to ‘upsell’ other services on the back of people’s generosity. Zarine is the founder and CEO of JustGiving. Together with Anne-Marie Huby, she launched the UK’s first online fundraising platform in 2001. A former lawyer and City banker, Zarine holds a BA in law from Cambridge University and was awarded the RSA’s Albert Medal in 2009 for ‘democratising fundraising and technology for charities’. MD Anne-Marie Huby co-founded JustGiving in 2001, having made her name in London as UK head of the international charity Médecins Sans Frontières. Read Anne-Marie’s thoughts on building a great culture on the Girls In Tech blog. Funding Circle is in fifth position in our List of Top 5 Trust Organizations in UK. With a quick application, dedicated account manager and fast decision, you can stay focused on your business while they focus on your loan. Taking your business to the next level has never been easier. Al-Khair Foundation is in sixth position in our List of Top 5 Trust Organizations in UK. Al-Khair Foundation (AKF) is always on standby to support victims during emergencies and disasters. People who are willing to give to charity are afraid whether their donated money will be used accordingly as promised by the charitable trusts. Corruptions or misdeeds often conducted by dishonest charitable organizations induce fear in people’s mind, leaving a negative impression before them and stop them from taking a generous step. People must understand that all charitable organizations, trusts, and nonprofits aren’t corrupt. There are numerous transparent, honest and dedicated charitable organizations toiling hard day and night to address the prevailing social problems, relieving the pain, agony, and suffering of the people and making valuable contributions to build a better world for the upcoming generations. All charitable organizations in UK are monitored and governed under strict rules and regulations of the government. All charitable organizations operating in the UK are subjected to the laws applicable for their particular structures and to the law on matters such as employment, contract, tort, intellectual property, data protection and competition. Charitable organizations based in England and Wales are principally governed by the Charities Act of 2011. Under this law, the charitable organizations do not need to comply with company law so they are thought to be more flexible than other charitable organizations in the country. However, these trusts are governed by the particular trust laws of the country which is a complex area and these organizations are bound to report to the Charity Commissions. Donors can be assured that whenever they are donating to the trust organizations based in the UK, the donated amount will be spent accurately on the charitable projects in compliance with the regulations of the trust deeds. Majority of donors often back out without making a contribution to any charity because they feel their small donations cannot help fund the charitable projects, which is entirely wrong. Small donations can make a huge difference when each one of us is contributing to the same cause and to one single project. The small ripples of generosity have the potential to turn into a greater force which can reduce unnecessary human sufferings and actually save uncountable lives. We don’t need to do great things every day to bring a change in this world. We need to do small deeds of good every day with great love.